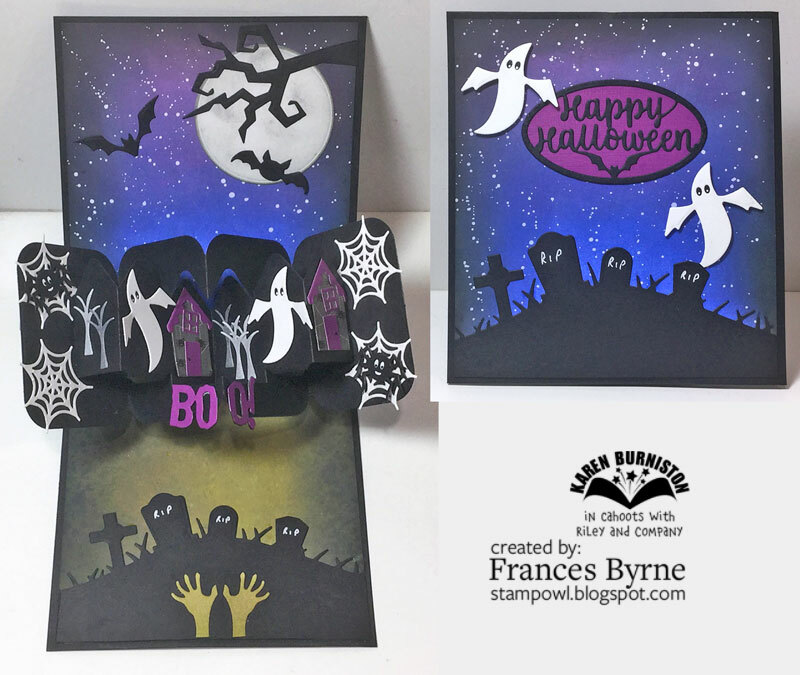 Welcome to our October Karen Burniston Designer Challenge. Our challenge theme this month is .... "HAPPY FALL, Y'ALL!" - make a card celebrating fall, autumn or Thanksgiving. 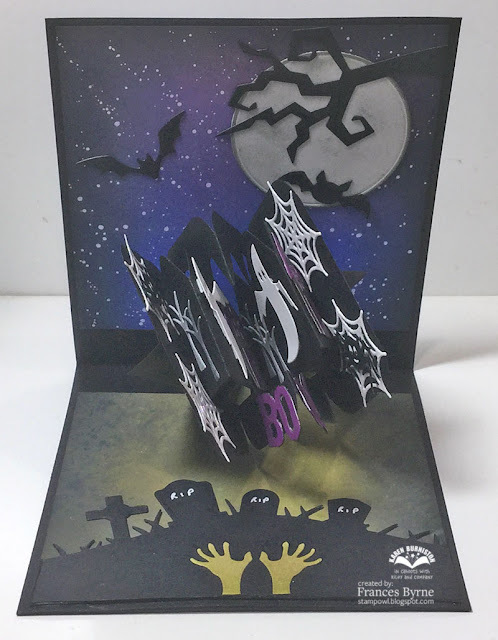 For my card today I have combined the House Pivot Panels die set along with the Twist Panel die set to create my Halloween scene. 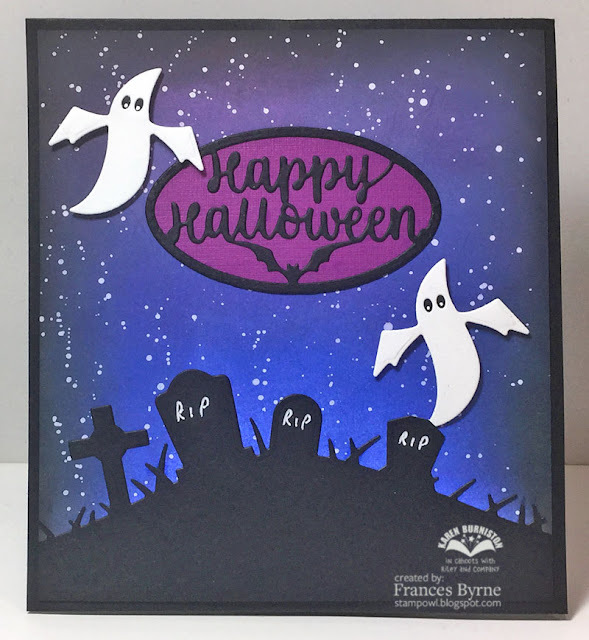 I decorated this panel using the dies from the House Pivot Panels, Halloween Scene, Halloween Elements and Halloween Charms die sets. To create the base of the card I sponge on Distress Oxide inks onto a white card base using Blueprint Sketch, Dusty Concord & Black Soot inks for the top panel and then sprinting white paint all over the background to create a starry night sky. For the bottom panel I used Forest Moss and Black Soot Distress Oxide inks and then spritzed with water from a distress sprayer. Here is a look at my card as it is starting to close. 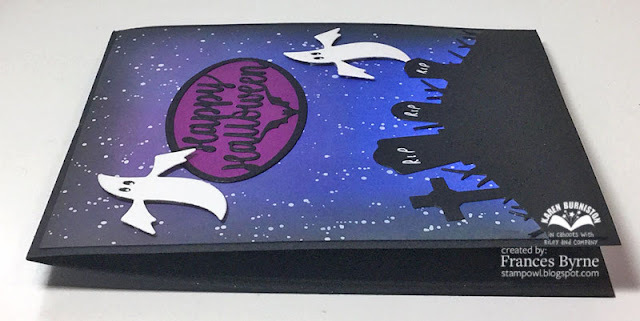 Along the bottom panel I have used the graveyard from the Halloween Scene die set and the hands from the Halloween Elements die set. For the top panel I die cut a circle from white cardstock using one of the circles from the Crosshatch Circles die set and then pouncing black soot ink to the circle using a blending tool. 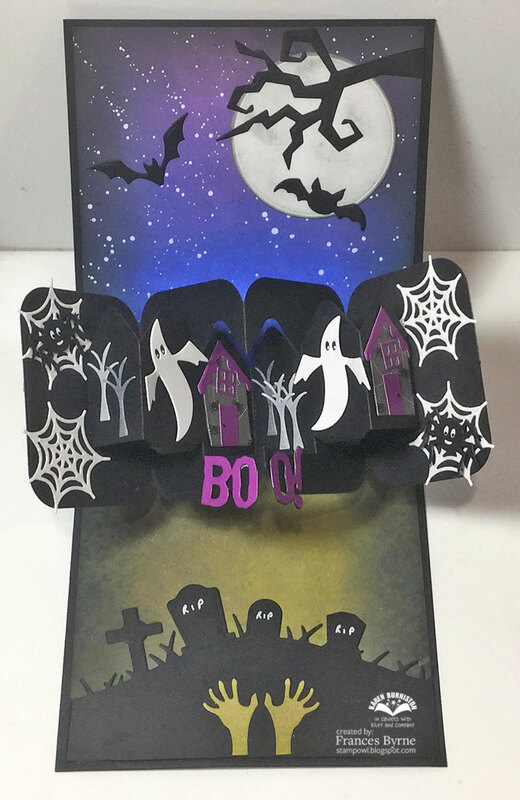 I added the tree branch & bat from the Halloween Scene die set. The second bat is from the Halloween Charms die set. As the focus is on the inside of the card I kept the front of the card simple, repeating some of the elements I used on the inside of the card. I also added the Happy Halloween oval sentiment which is from the new Halloween Charms die set. And finally a look at my card when it is closed. It may look a little thick, but it does flatten down a little more and will fit into an envelope easily. Your card is fabulous and the colors are amazing. Love it! !